Friends often ask me for my experiences about living in the US. What I tell them is: it really is how you see it in the movies. When I walk around on campus, cheerleaders are jumping and shouting on the grass, people bleach their teeth until almost transparent, and there's about nothing you don't find as a drive thru, from diners over pharmacies, banks to churches. Assuming the social security number is about social security. Believing someone who says This is not possible. Believing anything that is Guaranteed, 100% or No problem at all. Thinking the international system of units is indeed international. Thinking the number to be dialed before the city code is 0. Then finding out, it is 1. Using the same recipe for the country code to Germany (+1149). Using this to call Germany, from a motel, after dialing 9 to get a free line. Shouting Yes, I DO! and hanging up when someone asks me (in English) whether I have a problem. Thinking a dinner invitation is, well, a dinner invitation. Finding it funny that some people paint sidewalks in red. Trying to explain function and use of a dowel without using the word. To three male employees in a hardware store. A Scientific Bookstore in Frankfurt? "Stefan, do you know any good bookstore here in Frankfurt where I can get some physics books?" That's a question I often hear from guests at our physics institute, or from postdocs who are trying to familiarise themselves with life in Frankfurt. To my embarrassment, the only answer I can honestly give at the moment is that no, there aren't any such stores! 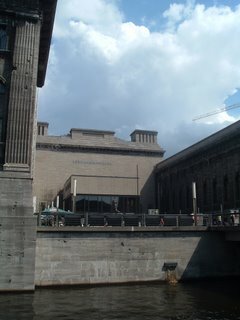 There is in fact one large bookstore, Hugendubel, which belongs to a German chain, comparable maybe to Borders. But there, you will find just some recent popular science titles - only in German, of course - , and a small collection of standard textbooks for undergraduates, also in German. If you are looking for a more advanced textbook, or even some monograph, or for recent popular science titles in English, such as Lisa Randall's Warped Passages or Peter Woit's Not Even Wrong, you will be very disappointed! For a town such as Frankfurt, with quite a large a university and several research institutions, this is not really what you would expect! 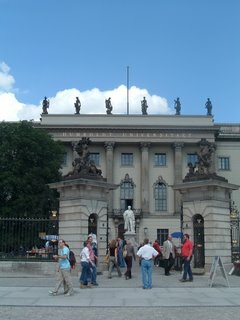 There was, in fact, one bookstore in Frankfurt which was specialised in titles in the sciences, math, and engineering. Unfortunately, over the last years, it has suffered from the declining number of math and science students, and from the ever-growing competition of amazon. But the real problem of this wonderful store was, after the death of its founder, Harri Deutsch, the obvious, complete lack of interest of its new owners in its unique standing as a scientific bookstore. Long-term experienced booksellers were fired, shelves became more and more devoid of interesting volumes, or even remained completely empty, and the sad end of the story, two months ago, was insolvency. I am quite sure that this end could have been avoided. On the other hand, I wonder if, maybe, time is up for specialised bookstores, and that in future, you just can hope that your local university bookstore (if there is one) or your local outlet of Hugendubel/Waterstone's/Borders/Phoenix/whatever has, by chance, a good assortment of scientific books. Unfortunately, with respect to bookstores, Frankfurt can't compete with none of theses places. But when I said that there is no location at all where to look for scientific books, that was not quite true. There is in fact one tiny store, at the Science Campus Riedberg: It is the former subsidiary of Harri Deutsch, which has found a new and confident owner. It is still quite empty, but maybe, in the near future, it will be the place to go when you are looking for scientific books in Frankfurt! So, Astrid and Dorothee, good luck with your new business! Yesterday, I was at Starbucks and found I should try something new. Being faced with a frightening picture of Frappuccino Pomegranate however, I went for same-as-always. Just instead of picking the NY Times (headline about an exhibition of 9/11 dust) I took a copy of the Santa Barbara Daily Sound (headline: two killed in school shooting). "[...] There's more to a great college experience than sitting in a beautiful library. What about sitting in a library full of beautiful people? UCLA's close proximity to Hollywood and Southern California's year-round sunshine make for an exceptionally photogenic student body. Score one for UCLA. 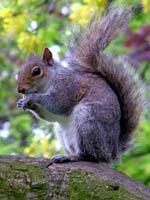 Harvard ranks a lowly three on the squirrel-o-meter [...]"
Okay, I have not much to say about the conjectured duality between the number of squirrels and an university's quality, except maybe that I'd consequently recommend as part of an competitiveness initiative to teach the first semester students how to treat their squirrels nicely. Let me then rather say something about the beauty myth. Not only shouldn't good looking be mistaken for beauty, but UCSB certainly beats UCLA in that matter. Just that you most likely won't find THE BEAUTIFUL PEOPLE sitting in the library. You'll find them surfing on the beach (boys), jogging up and down the beach (girls), or getting drunk in Isla Vista (mating ritual). If you're looking for a bottomline, there is none. I'll go to the beach now an watch the beautiful people of Southern California. Thanks to Kerstin for sending the link and making my day. In absence of quality thinking time, I will provide you with one of my favorite shortcuts to thinking: pictures. In this case, I found some particularly nice pictures in one of Stefan's talks. They depict very nicely the difference between common hadronic matter and the quark gluon plasma. The possibility to produce a state of matter as hot and dense as it was in the first moments of the universe is one of the primary goals for Heavy Ion collisions. For this purpose, heavy nuclei like those of lead and gold, are collided with highest energies and form an intermediate hot and dense state, the so-called fireball. The Relativistic Heavy Ion Collider (RHIC) at Brookhaven National Laboratory (BNL) performs such experiments, with which we hope re-create conditions similar to those in the very early universe. The top energy for the collision of gold nuclei at RHIC is about 200 GeV per nucleon. Such a gold nucleus consists of 197 nucleons (79 protons and 118 neutrons), which adds up to 40 TeV: that is roughly the energy of a mass of 10 milligram (a grain of coarse salt) falling from a height of 2.5 cm (or 1 inch), its macroscopic! Naive as I am, I always thought there are ten-thousands of nuclei in such a collision, but actually the number is roughly 70. Matter in the particle beam before the collision is present in its usual form of nuclei, which consists of neutrons and protons. In this state, the quarks are confined to these color-neutral bound states, which are called hadrons. This usual matter, which consists of protons and neutrons, is called hadronic matter. The fireball created in the collisions is so hot and dense, that it is expected to allow the quarks to move almost freely, thus removing the confinement into hadrons. This state, then is called the quark gluon plasma. The pictures below show both possibilities. where the grey bubbles indicate the color-neutral hadrons, inside which you see the valence quarks (large) and further virtual colored particles - so called sea quarks, and gluons. The arrows indicate the isospin of the quarks. The protons and neutrons consist of up and down quarks, with isospin +1/2 (up quark), and isospin -1/2 (down quark), respectively. Here the colored constituents are able to move freely within the blob of heated, deconfined matter. The initial temperature of the fireball which creates such extreme conditions is some hundred MeV. My unit converter says that is about 1013 Kelvin, a pretty hot soup. The challenge for the theoretical physicists is now to come up with observables, which allow to distinguish in which form the matter was present in the fireball. After all, in the dectors, nobody has ever found an isolated quark, its always hadrons. At RHIC, it is now quite sure that matter is not hadronic any more in the collision. But what it is instead, that is still not completely clear. At the moment, the state of matter created is dubbed a quark gluon liquid, which is a a liquid of strongly interacting quarks and gluons rather than a gas of weakly interacting quarks and gluons. If someone has a picture for that, I'd really like to see it. Yesterday I bought new running shoes. Herewith I present the first confirmed application of string theory: the bumpy white string. These shoestrings are absolutely ingenious. Not only do the ties hold better, they also don't slide through the holes and change the binding while running. If you are into mountain climbing, you might find them really useful. Also, later today there is an interview on Science Friday about the pros and con of string theory, with physicists Lee Smolin and Brian Greene. You can call in with your questions and comments at 1-800-989-8255 (3-4 Eastern). Note added Aug. 20st: See also the discussion of the interview at Lubos' blog. Astronomers who used NASA's Chandra X-ray Observatory will host a media teleconference at 1 p.m. EDT Monday, Aug. 21, to announce how dark and normal matter have been forced apart in an extraordinarily energetic collision. Maxim Markevitch, astrophysicist, Harvard-Smithsonian Center for Astrophysics, Cambridge, Mass. Doug Clowe, postdoctoral fellow, University of Arizona, Tucson, Ariz.
Sean Carroll, assistant professor of physics, University of Chicago, Ill. Note added Aug. 16th: See also the discussion at Lubos' blog. The Aug. 2006 issue of Physics Today has a feature article Stories from the early days of quantum mechanics, a transcribed colloquium given by Isidor Isaac Rabi in 1979. To remind you, Rabi was the guy who said Who ordered that? upon the discovery of the muon. Rabi: "We showed the Germans something that we called the Amerikanische Arbeitsmethode, the American way of working. Usually the laboratory was opened strictly at 7am and then closed at 7pm -- it was all so very un-American. We would come at 10am, and then, around 11 o'clock, the wives would come and make toast, crumpets, and so on while we went on doing our physics experiments. And we finished in very good time. It really worked. Also we were very happy while doing it. We'd have requests from the top floor of the building, Would you please sing more quietly? So it wasn't a time when you gritted your teeth and did an experiment. It was a joy all the time. That's the only way to do physics, I think." Hey, those were the days! I haven't had much time this week to write. When I am not busy with organizing my upcoming move to Canada, I am arguing with myself. I still haven't figured out what a particle is, and I still don't like the collapse of the wave-function. As you might have noticed, I changed the template for the blog, trying to get more WIDTH for the text. I also kicked out our temporary contributor Mirko, who disappointingly never wrote anything. I turned on word-verification, because we had a lot of spam-comments lately, and I am getting tired of deleting them. Here, in Santa Barbara, the Strings '06 programme at KITP has begun. From Aug. 28th to Sep. 1st, UCSB will host this year's conference on String Phenomenology, which I plan to attend, before I move to Waterloo. Last week, I got my work permit for Canada, and I can't recall I have ever been in an office which worked such efficiently! In contrast to my applications for US-visa, I was treated like a human being there. No fingerprints were taken, no photos. No interrogation about my past, present, and future. No request for the so-called ties to the home country, for which I used to bring letters from friends (someone told me bank statements from my German account would do, but I don't think these bank statements make convincing reason to go back there). As it turned out, I don't even need to apply for a visa. The permit was issued in a total of 5 hours. I have a one-way ticket to Toronto, my office and my apartment are a mess of things whose purpose I can't recall and which I have to stuff into boxes. Today, I spent several hours arguing with computer voices on service-free toll-hotlines, and almost managed to have my gas shut off on Aug. 1st. Besides this, I have nothing intelligent to say, except: have a nice weekend. Now I go back to arguing with myself. 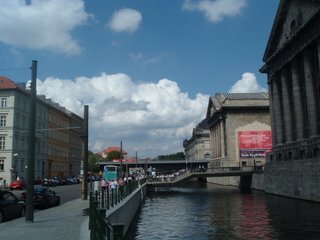 On Thursday, I had an appointment in Berlin. There is quite a convenient train connection from Frankfurt to the capital, with a the trip of about four hours for one way. I was expected at the Spreepalais next to the Dom at 3 pm, so I had more than three hours left when I arrived at the new, huge Berlin Hauptbahnhof. It was a very nice, sunny day, and I decided, besides preparing a bit for the meeting, to walk around in Berlin Mitte as a physical tourist. 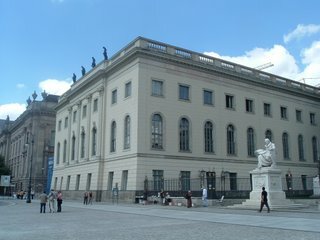 The big physics institutes of today's Berlin are not located anymore in the city center - the institute of the Technical University is in Charlottenburg, that of the Free University in Dahlem in the south-west, and the institute of the Humboldt University, the old Berlin University, has moved outwards to Adlershof in the south-east. But Berlin Mitte accommodates several locations of historical importance for physics. 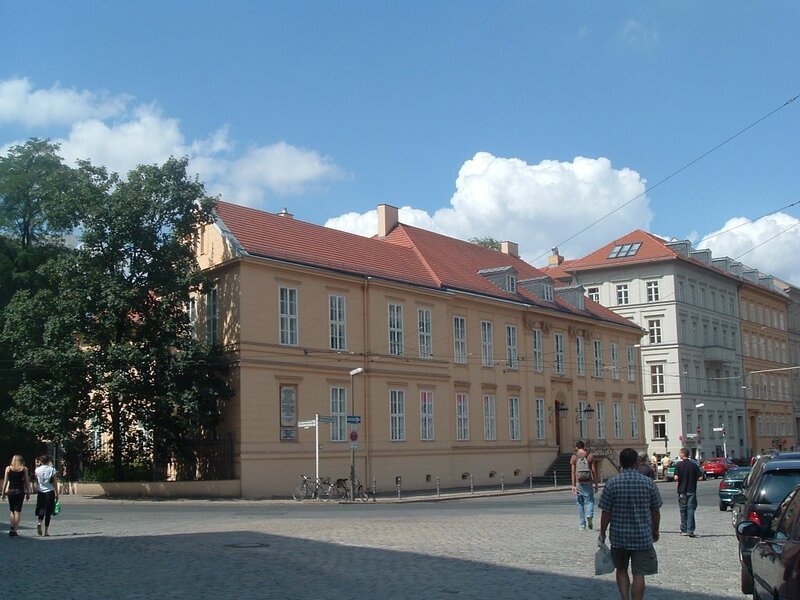 For example, it is the location of one of the first dedicated physics institutes in Germany. 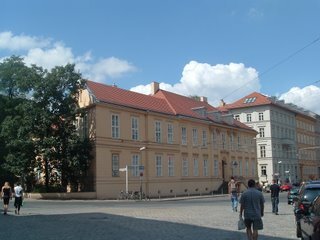 Remarkably, this institute did not belong to the Berlin University, but was privately owned by Gustav Magnus, who was the professor of physics at the University from 1845 to 1870. He may be known today mainly for the Magnus effect, which is relevant for all kinds of sports with balls. 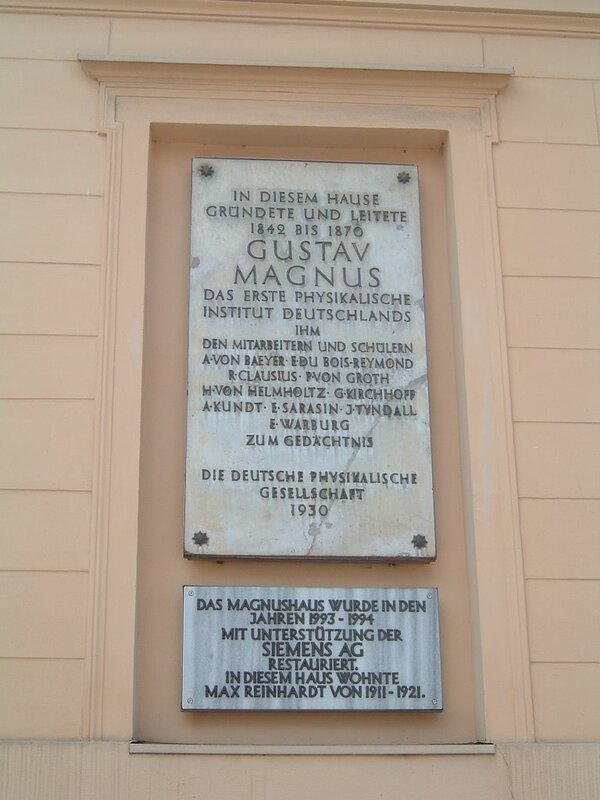 But besides doing research in chemistry and physics, he was also teacher of well-known physicists of the 19th century, for example of Clausius and Helmholtz. 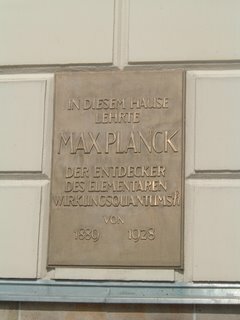 He offered practical laboratory work for his students in his house, and organized a weekly meeting which was to become the Berlin Physics Colloquium. 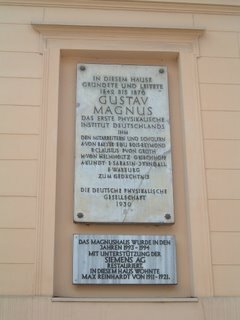 His institute today is known as Magnus-Haus, and it is used by the German Physical Society. 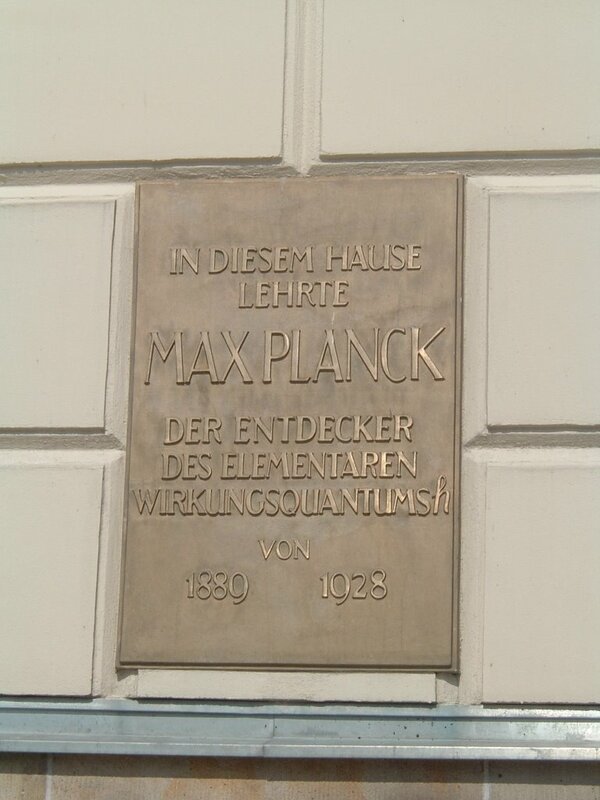 The lower plate states that theatre director and actor Max Reinhardt lived in the Magnus-Haus from 1911-1921, but it does not mention that it was also the home of Joseph-Louis Lagrange in the 1770s, when Lagrange was Director of Mathematics at the Berlin Academy of Sciences. I was about to turn back towards the direction of the Dom and to my meeting, when I spotted another bronze plate at the west wing of the University building. PS: The title of this post is shamelessly stolen form a regular piece in the journal Physics in Perspective, The Physical Tourist at Someplace. Berlin is the subject of the article in the December 1999 issue, from where I have obtained most information used here. The author of that piece, a science historian at the Max Planck Institute for the History of Science in Berlin, has also written a very interesting book about places connected to Einstein's life in Berlin - unfortunately, there is only a German edition so far. Tags: Berlin, Physics, History of Science. Last night I had a nightmare! Bigfoot knocked at my door and wanted to talk to me about the existence of the string theory landscape. Still on east-coast time, I wiped off the sweat from my forehead but couldn't fall asleep again. I switched on my laptop, and decided its time to post the review on Lee Smolin's new book. Last week I surprisingly received an email from his publisher who apparently doesn't mind me posting a review on my blog before the book is officially published. It seems the publisher's strategy is that every publicity is good publicity. Given the comments I had on his book, I can't say Lee looked very happy when I told him I'd write the review. So I thought it would be a nice gesture to let him add some comments. Anyway, since most of you haven't yet had a chance to read the book, I don't see any point in picking at details which I didn't like (there were plenty). So instead, this is more of a general summary of the book's content. However, I want to point out that I did not read the final version and that some sections might have changed in the last revisions. Lee's book analyzes the present stagnation that we experience in theoretical physics with the intention to understand its cause, and he proposes a strategy to ameliorate the situation. For this purpose, the presently most pressing problem in the US in investigated, that is the dominance of research by string theory, or better, the string community. Even though the string community's lack of self-criticism is the obvious center of concern, the aim of the book goes far beyond confronting string theorists with the problems of the 'real world out there'. Building up on his examination of the current situation, Lee argues that the way scientific programs and researchers are supported today is inefficient under the present circumstances. After some philosophical detours about the ethic of science, he eventually concludes with concrete proposals. "Why is physics suddenly in trouble? And what can we do about it? These are the central questions of my book." 5. Dark matter and dark energy. The following chapters then examine how historically great problems have been solved, what challenges have been met, and what detours have been made on this way. The scientific level is easily accessible for anyone with an interest in the subject. It is a fascinating history from Kepler's laws over Maxwell's unification of electricity and magnetism, via Einstein, Kaluza and Klein's idea of extra dimensions to the quark model, Yang-Mills theories, and towards the Standard Model. Two chapters are about the so-far unsuccessful searches for further unification (grand unification, technicolor, preons, supersymmetry...), and one further chapter is dedicated to the problem of quantum gravity and background independence. These chapters also provide the reader with a basis for the following parts and make the book fairly self-contained, though it is not recommendable as an introduction into the Standard Model or General Relativity on its own. The second part briefly summarizes the ideas behind string theory, the problems that come along with it, what has been done to accommodate the problems, and what further problems followed. By reading this history of string theory, it became clear to me why so many physicists were drawn towards string theory and its promises. It is a story full of surprising insights, successes and drawbacks. But most of all, it is an unfinished story. This part of the book is a very carefully written investigation of the achievements of string theory, and its failure to explain nature. It is a sometimes funny, sometimes sad description of the search for answers to the big five problems, whose pursuers lost their goal out of sight. Subsequent chapters are dedicated to the first and second string theory revolution, and to recent developments in AdS/CFT, brane world scenarios, KKLT, the landscape and the unavoidable anthropic principle. The part ends by evaluating the insights string theory has allowed us into the big five problems from part one. "Plainly, there are different approaches to the five fundamental problems in physics". It is exactly the part that I found missing in Peter Woit's book. Even though I could not avoid having the impression that the evaluation of promises and drawbacks in this part is less careful than in the previous part about string theory, it is an exciting journey! Unfortunately, it somewhat fuzzes out towards the end where Lee argues that "we have to find a way to unfreeze time". Though Lee told me that this part of his book is considerably improved in the final version, it still seems to me that these chapters are the optimist's antidote to the depressing conclusions from the previous part. As such they fulfill their purpose very well for the layman, who wants to get a glimpse on the variety of approaches by which we try to reveal nature's secrets. Those working in theoretical physics however, will be left with the desire for more details, and I hope that Lee's book succeeds in sparking a vivid discussion, as well as a critical evaluation, of string theory and the mentioned alternatives. The fourth - and in my opinion most important - part then analyzes why and how science works best, what sociological problems we face, and under which circumstances research flourishes best. It addresses the problem of groupthink in the string community, the disastrous low-risk-attitude of current funding, and the inefficiency in hiring decisions when it comes to preserving diversity. Lee points out that many of today's research strategies might have been appropriate some decades ago, but do now hinder progress. Political pressure on young as well as senior scientists has grown to become a reason for concern. He concludes in a summarizing chapter What can we do for science with a plea for open-mindedness and "intellectual freedom". Lee tells a story of a frustrating time, of waiting, but also a story of hope. It's a story told by someone who knows what he is talking about, someone who has a vision, and who doesn't get tired repeating and fighting. Fighting for science to stay scientific. It's a book that speaks of Lee's dedication for his work. And I guess it wasn't an easy book to write, given the necessity to criticize what many of his colleagues and friends work on, and what he has worked on himself. "I can only insist that I am writing this book not to attack string theory..."
There is no doubt that a big part of the book is a criticism of string theory. However, regarding the current situation, this was probably unavoidable. The last part of the book makes clear that its a constructive criticisms, and it sets a starting point for a scientific discussion about the future of theoretical physics. It is a book written by someone who is deeply concerned about the future of theoretical physics. It is also a book by someone who clearly sees the mistakes made, even though the presentation is not always that clear. The book lacks structure in the 3rd and 4th part, and it requires a certain amount of patience to follow through some of the excursions. But many anecdotes and analogies make the book an entertaining read, and for a popular science book it is indeed very nicely written. I am afraid this book will make many people who work on string theory and supersymmetry very very unhappy. But it will certainly influence those who currently consider going into theoretical physics. Maybe most important, it will encourage those who are frightened by the prospect to either give up their dreams, or to end up unemployed. I absolutely don't like the cover. The color choice is awful and the motive makes me wish I could knot up the strings to loops, such that whoever still wears shoes like this realizes his bad taste in clothing. Some years ago I was traveling through South Africa. In one of the first guest houses where I stayed, the lady of the house asked me whether I had seen Bigfoot. She spoke a very strange accent, so it took me some while to figure out she was actually asking whether I had seen the 'big five': lion, elephant, buffalo, leopard, and rhinoceros. We are scientists. 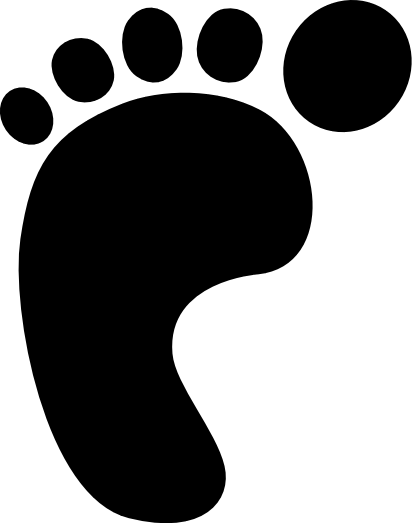 We should not loose the big five out of sight because we are searching for big foot's footprints in the landscape. USA Today: String theory: Hanging on by a thread? Lee kindly agreed to answer some of my questions about his upcoming book The Trouble With Physics, which will be published on Sep. 19th. Did the book cause you sleepless nights? Lee: "Yes, I don’t like disagreement and controversy, and I am not psychologically very good at confrontation. The idea that there were people who would disagree with the conclusions I was coming to, who are friends, or people I respect or, in some cases, life long role models, caused me a lot of anxiety and some sleepless nights." Lee: "The book has more than one intention, some specifically related to the problems of quantum gravity and unification, others about what science is and how it works. In its first conceptions, this was to be a book focused on the relationship between democracy and science and the role of disagreement, diversity of viewpoint and controversy in the process of science. I was very interested in a claim of the philosopher Feyerabend that the progress of science is fastest when the scientific community contains within it the largest diversity of views that the data allows. So first I wrote an essay on science and democracy that I proposed to turn into a book. The response was not very good. I was persuaded that an abstract argument would not be very convincing to anyone and it would be better to build the book around the story of a concrete case in science. Someone suggested that string theory would make a good case study to build my argument around. It took some time for me to convince myself to do that, as it would have been easier in some ways to write about a subject I hadn’t worked in. In the end, I decided to write about string theory because I had just gone through a long and difficult process of choosing which direction to work on, and it had required me to think through in detail all the evidence for and against the different approaches. As someone who has worked on most of the major approaches to quantum gravity I do this from time to time. The last time I had done such an evaluation I had decided to switch from LQG back to string theory, now the result took me from string theory to DSR. But the main theme remains broad issues of how science works and how it could be made to work better." What do you think is the part the sociology of science takes in that story? Lee: "Here is a metaphor due to Eric Weinstein that I would have put in the book had I heard it before. Let us take a different twist on the landscape of theories and consider the landscape of possible ideas about post standard model or quantum gravity physics that have been proposed. Height is proportional to the number of things the theory gets right. Since we don’t have a convincing case for the right theory yet, that is a high peak somewhere off in the distance. The existing approaches are hills of various heights that may or may not be connected, across some ridges and high valleys to the real peak. We assume the landscape is covered by fog so we can’t see where the real peak is, we can only feel around and detect slopes and local maxima. Now to a rough approximation, there are two kinds of scientists-hill climbers and valley crossers. Hill climbers are great technically and will always advance an approach incrementally. They are what you want once an approach has been defined, i.e. a hill has been discovered, and they will always go uphill and find the nearest local maximum. Valley crossers are perhaps not so good at those skills, but they have great intuition, a lot of serendipity, the ability to find hidden assumptions and look at familiar topics new ways, and so are able to wander around in the valleys, or cross exposed ridges, to find new hills and mountains. I used craftspeople vrs seers for this distinction, Kuhn referred to normal science vrs revolutionary science, but the idea was the same. With the scene set, here is my critique. First, to progress, science needs a mix of hill climbers and valley crossers. The balance needed at any one time depends on the problem. The more foundational and risky a problem is the more the balance needs to be shifted towards valley crossers. If the landscape is too rugged, with too many local maximum, and there are too many hill climbers vrs valley crossers, you will end up with a lot of hill climbers camped out on the tops of hills, each group defending their hills, with not enough valley crossers to cross those perilous ridges and swampy valleys to find the real mountain. This is what I believe is the situation we are in. And-- and this is the point of Part IV -- we are in it, because science has become professionalized in a way that takes the characteristics of a good hill climber as representative of what is a good, or promising scientist. The valley crossers we need have been excluded, or pushed to the margins where they are not supported or paid much attention to. My claim is then 1) we need to shift the balance to include more valley crossers, and 2) this is easy to do, if we want to do it, because there also there are criteria that can allow us to pick out who is worthy of support. They are just different criteria. For more on this, read Part IV or my Physics Today essay." Whom is the book addressed to? Lee: "Simultaneously to laypeople who follow and care about science and to fellow scientists, as well as philosophers and historians of science. The book is not a popularization, it is a serious examination of ideas. Yet a lot of work went into writing it so members of the public could read it easily. I imagined my reader as someone who has read a lot of books already about contemporary theoretical physics, and wants to know how things actually stand with the beautiful ideas they learned about. I wanted this book then to be an honest accounting, a kind of antidote to all the promises we had made to the public to solve the deep problems of physics. But at the same time I wanted to address fellow scientists. I take the advice of John Brockman who told me when I was writing my first book to write for colleagues, but without technicalities, so that the public can look on as we experts raise with each other the questions we cannot answer in our technical work." If you were a PhD student now, what would you do? Lee: "For someone starting now the open problems are a great opportunity, and the right person will seize it. Assuming that I had an ambition to solve the big problems, I would first learn the very basics, and study quantum mechanics, general relativity and field theory, all from the original papers, to get a sense of not just the physics, but how the inventors thought about them. Then I would learn all I could of the theories studied the last decades, and try to extract lessons from their partial successes and failures. Then I would stop reading and decide that some particular problem was my personal responsibility. I would then concentrate on that problem, day in and day out, till I had invented an original solution to it." Well, I hope you'd find a way to pay your rent while doing so. Lee: "What I have observed after many years-with some exceptions-is that the scientists who succeed professionally are not always the ones who do what is trendy or what opinion says at the time is what you must do to have a career. The problem with following trends is that lots of people try to do that and the result is that they all reduce their chances. There are fewer places for people who ignore fashion and follow their own ideas, but there are also fewer people who have the courage to follow their own ideas and the imagination to have good ideas. Life is not fair, but very roughly these things seem to even out, so that the best advice career wise seems to be to figure out what you love doing and what you are good at (which is often the same thing) and just do that. Whatever you do the invariants are that you have to work hard to get good results and you have to work also at communicating your results." What where the reactions on your book so far? Lee: "I have heard a lot of positive feedback from people who have read the book. I am very glad to hear from many readers that the book is balanced and that, for example, it gives the reader the sense of excitement many of us had during the two string theory revolutions. Someone even wrote that my treatment of string theory is “loving” and I was glad as indeed that is how I feel. I have heard a few angry comments from people who read only the advertising copy. While I agree that some of the ad copy was too provocative, and did ask to have it toned down, this was still disappointing. I hope they will read the book and be as fair to it as I have aimed to be with those with whom I disagree. The book is an argument, it invites an argument back in return. The major negative comment I heard from readers of drafts was that I was not as critical about loop quantum gravity, DSR and others as I am on string theory. I did try to remedy that in the final version. Of course, there is no reason to hide the fact that I strongly believe in a background independent approach, even if I doubt that LQG in its present form is more than a model of a background independent theory we can learn from. I am sure I will hear many negative comments, but I hope that they come from people who take the time to read the book and consider the detailed arguments it makes. I hope there is not much more speculations of motives and personal attacks as we see from a few people who, without having seen it, believe they know what is in it and why I wrote it." Lee: "I have said what I wanted to say, now I want to listen, especially to those who will disagree with it. I see the book as the start of a conversation, and it is my turn now to listen. "